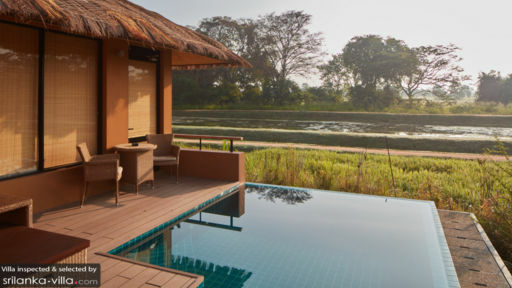 Found overlooking the renowned Sigiriya Rock, Sri Lanka, a UNESCO World Heritage Site as it affectionately termed as the ‘Cultural Triangle’ including the regions of Anuradhapura and Polonnaruwa, Water Garden Sigiriya is an absolute luxury retreat with options to choose from deluxe villas and twin duplex villas that opulent in their interiors as well as exteriors. Surrounded by lakes and nature, the villa prides itself in offering a unique experience which will remain with you for years to come. Enjoy the tranquillity of the region while lounging and relaxing endlessly amidst nature! 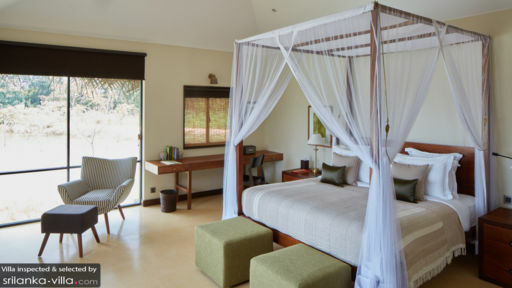 With glass walls and sliding glass doors, the single bedroom at Water Sigiriya’s Superior Deluxe Villa is the epitome of comfort and luxury. A four-poster bed draped in the finest of fabrics is laced over a plush mattress that guarantees a dreamless sleep. Two chairs and a table stand in the corner next to the glass walls to enjoy a cup of tea against a spectacular backdrop. A writing desk stand against the wall where you can get some work done or write. Just outside are some rattan chairs for lounging in the peaceful surroundings. The en-suite bathroom is equally luxurious with a freestanding bathtub and twin vanity sinks. 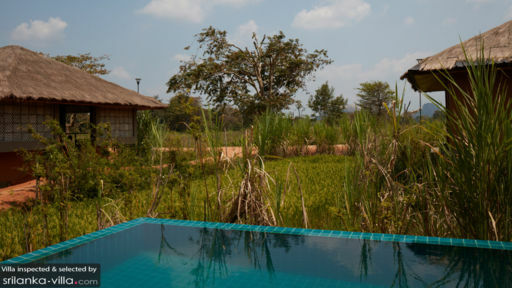 The Superior Deluxe Villas at Water Sigiriya are one-bedroom homes with plunge pools surrounded by fields of vegetation that ensconce the entire villa in a whimsical fancy. There is a pool deck with sun chairs where you can relax and lie back for a nap or to bask in the sun for a good working tan. The beautiful surroundings will lift up your mood and you can have some time to your thoughts or head out for a walk to a nearby lake to clear your head. The living area is an art-deco style with many distinct pieces including floor lamps and cushions that work together. A TV is in place for your entertainment and the opulent interiors immediately remind you of a five-star hotel with its muted colours, wooden interiors, and plush seating. There is artwork that lines the walls to bring about the luxurious and signature vibe at the villas. For dining purposes, Water Sigiriya offers guests multiple options that are excellent and offer an array of delicious dishes. There is the twin-level bar with an outdoor seating and the main restaurant with an extensive menu. There are beverages for you try out as well as signature dishes all the while enjoying a splendid view of Sigiriya Rock! Head out to the open-concept lounge at the resort that is common for everyone for a nice view and the wind while indulging in some appetizers. The villas offer ample amenities and services to ensure you stay is memorable and exemplary. You can travel the buggy to traverse the property grounds, take an excursion to the nearby lakes, or take a ride on helicopter. There are butlers to cater to you and a fitness centre with all kinds of equipment. Other activities that you can engage in include archery, billiards, and cycling! The villa is at a truly idyllic location with Sigiryia Rock looming in the background and just waiting for a visit from travellers. There is Minneriya National Park nearby as well as the historical site of Dambulla where you have the cave temple, another UNESCO World Heritage Site.